It has been shown that convenience, ease of dispensing and favorable tolerability are key characteristics that may increase patient compliance with topical dermatologic therapy.,, Additionally, the quantity of drug utilized with topical application may be affected by the type of vehicle used, characteristics such as viscosity, and the type of packaging used (for example, a tube, jar, pump canister, etc.). Under-utilization of a product will not produce optimal results within a given treatment period whereas over-utilization of a topical product leads to waste, an increased risk of irritation and other side effects and overall increased costs of therapy. The amount of medication used correlates directly with the cost of a given intervention over time. Third-party payers frequently base reimbursement and the amount of a topical medication dispensed on what they deem an appropriate quantity for a given treatment period. Exceeding this amount may result in increased medication costs. Determination of drug quantity used per application is important both to optimize product use without waste and to predict how long a given quantity of a prescribed drug should last if applied according to instructions. To identify, measure, and describe the difference in content usage and satisfaction between standard tube vs MDose™ (Metered Dose Technology) when used by the consumer to apply topical medications. Fifty subjects were enrolled in a randomized cross-over design. Subjects were instructed to apply a specific amount of an inert gel to their forearm four times daily for two days. Subjects were to document each application and complete a preference survey. Each individual gel container was weighed and recorded prior to dispensing to the subject and upon return of the product. 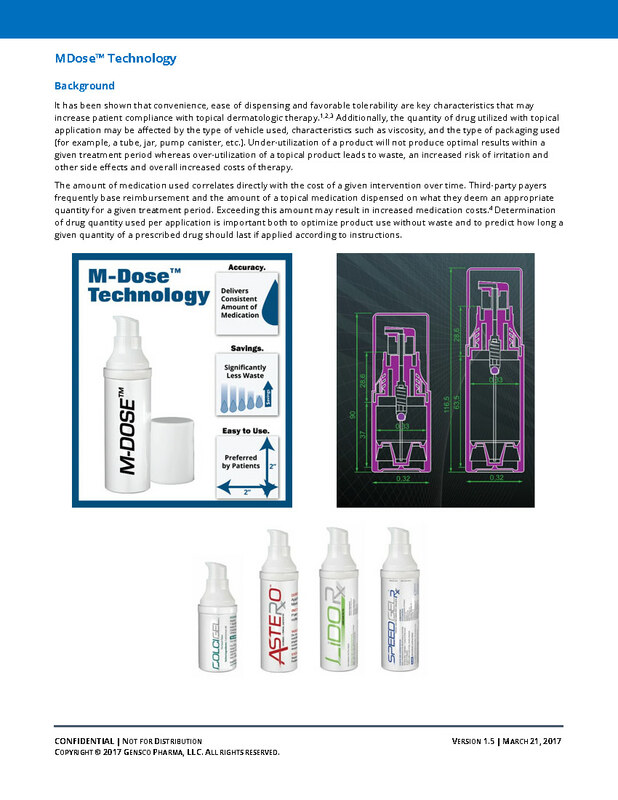 Subjects utilizing the MDose™ Technology system reduced all waste, resulting in dosage accuracy of the applied prescribed medication. Subjects who applied medication from the standard tube used 60% more inert gel with less precision and more waste of the prescribed medication. The majority of subjects preferred the MDose™ Technology overall for its ease of use, less mess and convenience. R Woodford and BW Barry, Bioavailability and activity of topical corticosteroids from a novel drug delivery system, the aerosol quick-break foam, J Pharm Sci, 66 1, 99-103 (1977). M Parrini et al, Efficacy and tolerability of ketoprofen lysine salt foam for topical use in the treatment of traumatic pathologies of the locomotor apparatus, Clin Ter, 141 9, 199-204 (1992). L Daffonchio et al, Effects of a new foam formulation of ketoprofen lysine salt in experimental models of inflammation and hyperalgesia, Arzneimittelforschung, 45 5, 590-4 (1995). CH Purdon et al, Foam drug delivery in dermatology: Beyond the scalp, Am J Drug Deliv, 1 1, 71-75 (2003).